We can't accuse the two Republican Senate candidates of trying to dodge The New Mexican. Both Heather Wilson and Steve Pearce took time out of their busy schedules for interviews with me. And I appreciate that. Just a couple of weeks before, their counterparts in the 3rd Congressional District primary — both Republicans and all six Democrats — answered a similar questionnaire for us. The deal was to answer all questions "yes" or "no" — just as if they were voting on a bill. Those who wanted to explain their answers could do so with the promise that some of their explanations might be quoted in the profiles we were writing and that their complete answers would be posted verbatim on The New Mexican's Web site. The questions dealt with issues such as Congress investigating possible war profiteering in Iraq, ethanol subsidies, "net neutrality," medical marijuana and whether Immigration officials should give special consideration to undocumented immigrants who have children who are U.S. citizens. There were no trick questions. And most of the topics were those both Wilson and Pearce have addressed in speeches and debates. A spokeswoman for Wilson said her candidate didn't like the yes-or-no format. Some of the congressional candidates also expressed misgivings about that, though all agreed to submit. A spokesman for Pearce contacted my Capitol bureau colleague, Kate Nash, asking about our deadline. But we never received his answers. After this long and bitter campaign, I guess it's nice Pearce and Wilson found something they could agree on: ignoring The New Mexican questionnaire. 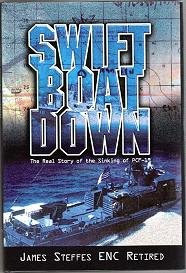 The swift boats are coming! Rule of thumb: Just about any time a Democrat gets criticized these days, it's not just an "attack." It's swiftboating. The term originated four years ago when a Republican-funded group called Swift Boat Veterans for Truth ran ads questioning the truthfulness of John Kerry's military record. Last week, when CD 3 candidate Don Wiviott began his attack-ad campaign against fellow Democrat Ben Ray Luján, Luján's campaign reacted with an e-mail: "Don Wiviott knows his only chance to win is with a Republican Swift Boat-style smear campaign." But poor Tom Udall. The general election hasn't started and already he's been "swiftboated" twice. 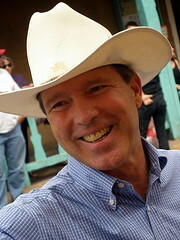 When an out-of-state social conservative group, Common Sense Issues, began conducting a "push poll" here for the benefit of Republican senatorial candidate Steve Pearce, Udall's campaign responded with a fundraising e-mail saying, "The GOP Swift Boat attacks on Tom Udall have begun here in New Mexico." 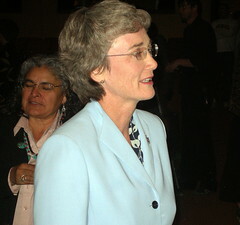 It turned out the push-poll was aimed more at Heather Wilson. Only the homes of registered Republicans were called, the leader of CSI said — though some negative things were said about Udall in the automated calls as well. On Tuesday, the Udall campaign sent another fundraising e-mail, this one dealing with President Bush's visit to help CD 1 candidate Darren White. The Udall letter said the visit was "to raise money from big donors to fund their dirty 'Swift Boat' attacks. You can bet this money will directly fund their efforts to distort Tom's record of integrity and standing up for the people of New Mexico." According to the White campaign, the $317,000 raised at the Bush event will be split between the White campaign and the state GOP. 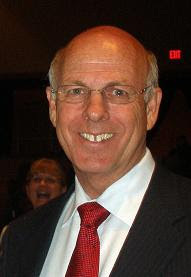 A state Republican spokesman said the party is expected to get only 20 or 30 percent of the money raised at the event. That money, he said, will go to set up a volunteer get-out-the-vote effort, not campaign ads. There is one candidate who could make a case about swiftboating. One of the top contributors to the anti-tax group Club for Growth — which has spent nearly $400,000 in ads calling Wilson a "liberal" — is Houston home builder Bob Perry. Perry has donated big-time to New Mexico Republicans in past elections. And in 2004, he was a major funder of Swift Boat Veterans for Truth. Wilson hasn't been shy about blasting Club For Growth. But she's yet to say anything about swift boats. Political prosecutions: An interesting part of one of Udall's recent campaign ads occurs when he says, "As attorney general, when I prosecuted corrupt elected officials, it didn't matter to me if they were in my party." Udall prosecuted one Democratic official — former state Rep. Ron Olguin of Albuquerque, who was convicted in 1992 for accepting a bribe, soliciting a bribe, attempting to commit a bribe and conspiracy to solicit a bribe. Eventually his convictions for accepting the bribe and conspiracy were overturned on appeal. Olguin was sentenced to a year in prison. As a result of the trial, he was formally censured by the state House of Representatives, making him the first — and so far only — sitting legislator in New Mexico history to be censured. But I wonder if the talk about prosecuting members of his own party might be a subtle jab at a potential Republican opponent. Wilson has been criticized for a phone call to then U.S. Attorney David Iglesias. Iglesias says he considered that call pressure from Wilson to hurry up with the prosecution of former state Sen. Manny Aragon, a Democrat, before the 2006 election. Wilson denies that was the purpose of her call. If Wilson survives the primary, be ready for some not so subtle jabs concerning Iglesias.